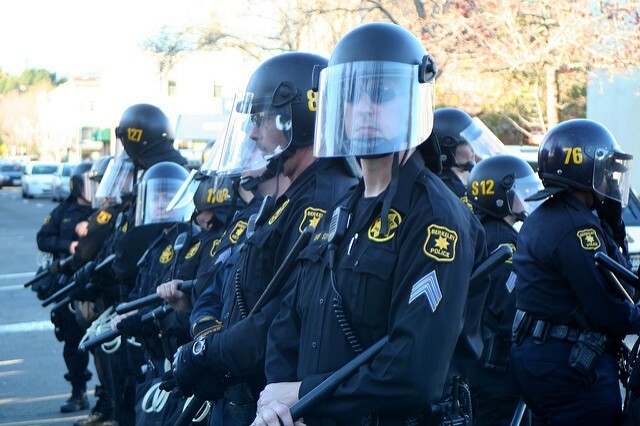 Urban Shield is a full‐scale regional preparedness exercise funded by the Bay Area Urban Areas Security Initiative (UASI), a project financed by the US Department of Homeland Security. It assesses the Bay Area UASI Region's response capabilities within multi‐discipline procedures, organization, planning, policies, equipment and training. During the Urban Shield trainings, participants are allowed to use military grade weapons, gear, and munitions, much of which is available for purchase at event’s vendor show. Boomer Vicente, ASUC senator and primary sponsor of the resolution, said in a recent interview that the removal of Urban Shield trainings is crucial to student safety and comfort around campus. “Our senators do not support [Urban Shield] because of it's racist trainings and how it promotes militarization on campus. The training itself promotes this idea that people of color are always a threat or are terrorists. The resolution calls to reform training policies that UCPD participates in so the department no longer perpetuates racism and Islamophobia,” he said. Vicente said the UC Berkeley Graduate Assembly plans to write a bill in support of the ASUC’s decision. In addition, the resolution calls for a reformation of police training policy on all UC campuses. “The resolution asks the External Affairs vice president to work with the UC Student Association and ask to reform UCPD training statewide so not only Berkeley won’t participate, but so other campus police departments won’t participate either,” said Vicente. According to UCPD Administrative Sergeant Sabrina Reich, UCPD has participated in Urban Shield since the program’s launch in 2007. “Urban Shield provides realistic scenario-based training that our officers cannot get anywhere else. Our officers bring this training and experience back to the campus so we can better prepare and respond to a variety of emergency situations,” Reich said in an email. Reich also said UCPD officers receive cultural competency training. “We recently hosted the Islamic Networks Group who provided Muslim cultural awareness training to our police officers and professional staff,” she said. However, Vicente stresses that many students and community members, including himself, feel threatened by the level of police militarization the Urban Shield trainings promote. The resolution highlights the alleged beating and harm on students by UCPD during the Occupy Cal Movement, as well as how UCPD took part in a training scenario in which a Muslim man was said to have been fired from his job and began “screaming that he wanted to hurt the Jews,” and that he frequently visited pro-jihadist websites, anti-Semitic websites, and websites with information on how to build weapons of mass destruction. “Modern technologies have made the blatant racism that is internalized within police departments apparent. With this in mind it is imperative that the influences of racist, anti‐black, ideologies be recognized and prevented on a systematic level,” the resolution also states. According to Reich, UCPD currently intends to participate in this year's Urban Shield training, which will take place on September 9-12.